The Arctic climate is changing rapidly, breaking at least a dozen major records in the past three years. Sea ice is disappearing, air temperatures are soaring, permafrost is thawing and glaciers are melting. The swift warming is altering the jet stream and polar vortex, prolonging heat waves, droughts, deep freezes and heavy rains worldwide. Editor’s Note (12/12/18): On Tuesday, the National Oceanic and Atmospheric Administration announced that the past five years have been the warmest on record in the Arctic and that the region is warming at twice the rate as the global average. Those were just two of the worrisome trends in NOAA’s annual Arctic Report Card. 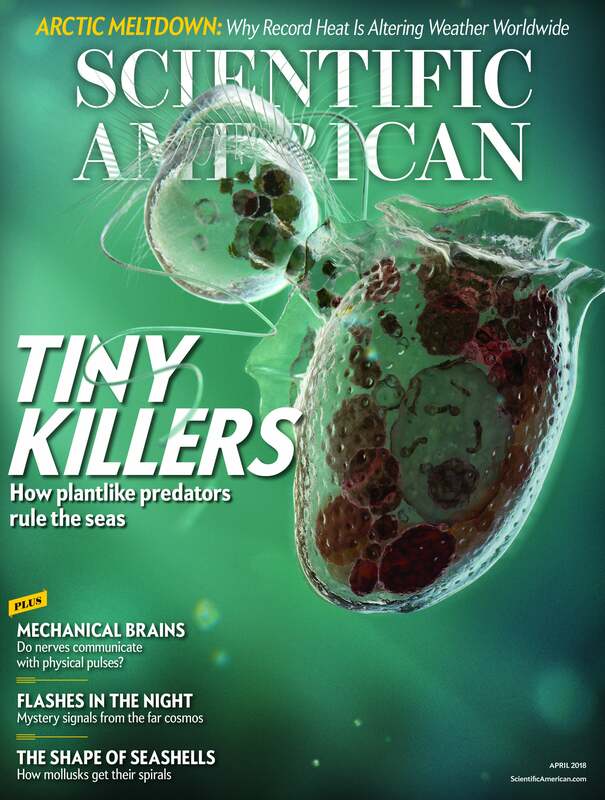 In our April issue, climatologist Jennifer Francis laid bare many of the same details, explaining how the climate change in the region threatens human society worldwide through sea-level rise, extreme weather amplification and ecosystem disruption. Twenty-five scientists, including me, had an epiphany about the Arctic in 2003. The National Science Foundation had invited us to a retreat in Big Sky, Mont. Before this gathering, each of us had been focusing our Arctic research on our own narrow topics. As we shared our perspectives, we came to a frightening realization: the changes we had been finding individually were connected. They fit together perfectly. The Arctic system as a whole was careening toward a precarious new state. And hope of stopping it already seemed unlikely. We published a paper with a stunning, controversial conclusion: At the current rate of change, there was a real possibility that within a century, the world could witness a summer Arctic Ocean that would be ice-free, a state not seen for thousands of years. Today I am startled again because it now appears that the ocean will likely be free of summer ice by 2040—a full 60 years earlier than we had predicted little more than a decade ago. The Arctic is changing exactly the way scientists thought it would but faster than even the most aggressive predictions. The recent behavior is off the charts. In just three years, more than a dozen climate records that had each stood for many decades have crumbled, including those for disappearing summer sea ice, decreasing winter sea ice, warming air and thawing ground. These trends signal trouble for people around the world. The last time the Arctic was only slightly warmer than today—about 125,000 years ago—oceans were 13 to 20 feet higher. Goodbye Miami, New Orleans, the naval base in Norfolk, Va., most of New York City and Silicon Valley, as well as Venice, London and Shanghai. New research suggests that rapid Arctic warming also tends to reroute the jet stream in ways that could allow punishing weather patterns to linger across North America, central Europe and Asia longer than usual, subjecting millions of people to unyielding heat waves, droughts or relentless storms. Plankton are increasing throughout the southern Arctic Ocean, which may disrupt food chains that support commercial fisheries. And the massive ice melt is adding to an enormous blob of freshwater south of Greenland that may be slowing the Gulf Stream, which could significantly change weather patterns for continents on both sides of the Atlantic Ocean. What’s driving this breakneck change? Scientists expend a lot of energy watching the Arctic because it is so sensitive to climatic change. It is a “canary in the coal mine” for the earth’s entire climate system. The long list of records that have been smashed during the past several years leaves no doubt that decades of unnerving climate simulations are on target. But the data say something even greater: our projections of changes on the way may be far too conservative. In only 40 years the extent of ice across the Arctic Ocean in summer has shrunk by half. Yes, half. The volume of sea ice, year-round, is way down, too—about a quarter of what it was in the early 1980s. Until recently, scientists had thought it would take until at least the middle of this century to reach these extremes. Summer sea ice is vanishing quickly because of feedbacks—vicious cycles that can amplify a small change. For example, when a bit of extra heat melts bright-white ice, more of the dark ocean surface is exposed, which reflects less of the sun’s energy back to space. That absorbed heat then warms the area further, which melts even more ice, leading to yet more warming. In winter when the sun is not shining, other feedbacks take over. For example, sea ice floating on the Arctic Ocean acts like an insulating sheet, preventing heat and moisture under it from escaping into the atmosphere. When that ice recedes, more heat and moisture can warm the air, further retarding ice formation. Computer simulations generally show ice disappearing too slowly, contributing to the conservative estimates of future warming. Disappearing sea ice is not the only transformation keeping researchers like me awake at night. The other two types of what used to be called permanent ice in the Arctic are also declining steeply. Permafrost—soil that usually remains frozen year-round—has been thawing. Buildings constructed atop permafrost are collapsing, trees are toppling and roads are buckling. In addition to disrupting daily life for local residents, thawing soils also can release large quantities of heat-trapping gases into the atmosphere. When the organic matter that has been locked in permafrost for thousands of years thaws, bacteria break it down into carbon dioxide (if oxygen is present) or methane (if it is not). Arctic permafrost contains about twice as much carbon as the atmosphere holds now, so widespread thaw could greatly exacerbate global warming—which would lead to even faster thaw. Today’s computer models do not adequately capture the impacts of thawing permafrost, again contributing to substantial underestimates of future global warming. The third type of previously permanent Arctic ice is the frozen water on land, including glaciers and Greenland’s enormous ice cap, which is more than a mile thick. Losing this ice has dire consequences worldwide because, unlike melting sea ice, the runoff into the ocean raises sea level directly. During the summer of 2016 the total mass of Greenland’s ice sheet (estimated using satellite measurements of how it affects the earth’s gravity) reached the smallest value since satellite observations began in 2002. The levels are also lower than any amount going back to the late 1950s, when the mass was estimated in other ways. A recent investigation suggests that the accelerating ice melt on Greenland’s surface is hastened by warming effects linked to dwindling sea ice. Reduced sea ice and rapid Arctic warming have other far-reaching effects. The combination may alter upper-level winds so that they carry additional heat and moisture from southerly latitudes toward the North Pole. 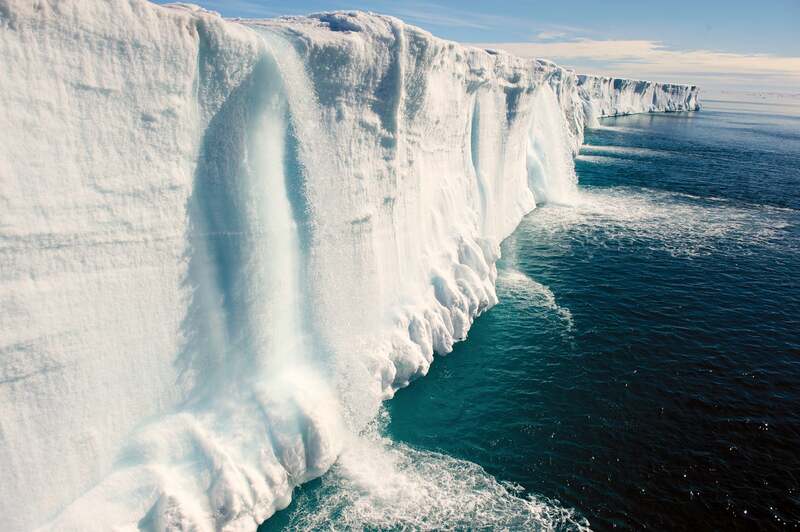 In 2012 the then record Greenland surface melt resulted from an unusually strong and persistent ridge of high pressure in the atmosphere—a so-called blocking high. It brought not only heat and moisture from the south but also soot from wildfires around the Northern Hemisphere. That soot darkens ice and snow surfaces (lowering its albedo, or reflectivity), which then absorb more of the sun’s energy, accelerating melt—another one of those vicious cycles. Blocking patterns—large eddies in the jet stream—near Greenland appear to be occurring more often in recent decades, especially in summer months, which probably accounts for at least part of the upward trend in melting. Ice-mass loss during the summer of 2016 was the third highest on record, trailing 2010 and 2012. New work by my colleagues and me suggests that the greater number of blocking highs most likely is tied to global warming. Computer simulations struggle to form and break down blocks realistically, however, so it is hard to say how these patterns may act in the future. Other Arctic behavior is equally outlandish. During the past two winters record-breaking heat waves near the North Pole were surpassed by more record-breaking heat waves. Waning and thinning sea ice is part of the cause, providing less of a barrier for the ocean’s heat to enter the air. The jet stream’s wild north-south swings also brought record pulses of warmth and moisture to far northern latitudes. Scientists and Arctic residents often fail to appreciate the strong effects that the extra moisture can create. For starters, water vapor is a greenhouse gas, so in a dry Arctic winter atmosphere, a little more moisture can trap substantially more heat. Moreover, when that moisture condenses into clouds, it releases latent heat, further warming the air. Finally, more clouds trap more warmth below them, one more factor contributing to the Arctic meltdown. Although we have more to learn, it has become clear that rapid Arctic change is under way, the most dramatic in human history. Given this stark reality, atmospheric scientists are trying to pin down the effects that the changing Arctic may have on people and ecosystems around the world so society can decide how to react and prepare for the future. An obvious example of global effects is coastal flooding. According to a new report by the Union of Concerned Scientists, about 170 U.S. coastal communities will experience chronic inundation within 20 years. By the end of this century, if nations keep emitting carbon dioxide as they have been, most large coastal cities around the world will face regular, disruptive flooding. This eerily prescient report was published just weeks before Hurricanes Harvey, Irma and Maria capped the U.S.’s most destructive and costly hurricane season ever. There is also mounting evidence that strong warm-ups in the Arctic’s lower atmosphere can affect winds in the jet stream and even higher, in the stratosphere, home to the polar vortex wind pattern that circles the Arctic. Northward peaks and southward valleys in the bending jet stream generate the high- and low-pressure centers we see on weather maps as a capital H or L. The bends control our weather in the Northern Hemisphere. But if extremely large bends occur more often, we can expect to see an uptick in extreme conditions where billions of people live. That is because large bends in the jet stream tend to progress more slowly from west to east, causing the weather systems they create to hang around longer. Think prolonged heat waves, relentless rains and stalled tropical storms like Hurricane Harvey, which swamped Houston in August 2017—as well as more intense fire seasons like the one in California, also in 2017. Large waves in the jet stream, along with strong Arctic warming, can disrupt the polar vortex, prolonging deadly deep freezes or parades of snowstorms, including the long stretch of severe cold that gripped the northern U.S. in early January of this year. A polar vortex collapse can also perpetuate wild jet-stream swings that deliver crazy heat waves to Alaska and the far north, creating yet another vicious cycle that accelerates Arctic warming. Some studies suggest that Arctic warming is closely connected with these wavy patterns; others say proof of the connection is still tenuous. Research on this hot topic is advancing quickly. A rapidly warming Arctic most likely will significantly alter habitats on land and at sea. Already, as sea ice recedes, plankton blooms have appeared in new areas during new seasons, enticing species of fish from lower latitudes to move into Arctic waters while native fish disappear. Earlier spring snowmelt across high latitudes has led to earlier greening of the tundra and earlier hatching of insects; migrating birds, which take their cues from the length of daylight hours, may arrive at Arctic food sites too late for the feast. Peoples of the Arctic are feeling the impacts, too; melting ice is keeping them from traditional hunting grounds and even forcing them to uproot towns threatened by coastal erosion from high storm waves in areas that used to be protected by ice along the shore. At the same time, big countries and big companies are swooping in to search for newly accessible natural resources, as tensions rise over who can claim which parts of the vast, rich seabed as theirs. The revelation my colleagues and I had at the Big Sky retreat replays in my head every time another long-lived weather pattern wreaks havoc or another Arctic record is broken. Now my neighbors are catching on. Polls suggest that most Americans think that the loss of Arctic ice and the jet stream—which has fast become a household term—are conspiring to create weird weather. The old Arctic may have been ruthless, but it was stable. The new Arctic is less predictable and may be changing in ways that are irreversible, with ripple effects on life around the globe. Are these impacts still avoidable? Yes and no. Because the climate’s response lags behind the increases in greenhouse gas concentrations and because carbon dioxide has a very long lifetime in the atmosphere, future change is already baked into the system. But the magnitude and pace can be reduced if society moves quickly to slow emissions and if methods can be developed to extract carbon from the atmosphere in large quantities. Progress on both these fronts is rapid, though likely too little, too late, to preserve the earth and the Arctic as we have known them. Prepare for the unexpected. Arctic Matters: The Global Connection to Changes in the Arctic. National Research Council. National Academies Press, 2015. Amplified Arctic Warming and Mid-latitude Weather: New Perspectives on Emerging Connections. Jennifer A. Francis, Stephen J. Vavrus and Judah Cohen in WIREs Climate Change, Vol. 8, No. 5, Article. No. e474; September/October 2017. The Jet Stream Is Getting Weird. Jeff Masters; December 2014. Jennifer A. Francis has been a research professor in the department of marine and coastal sciences at Rutgers University since 1994. She specializes in Arctic climate change and its links to weather worldwide.